Romance in the Closet: A Stenciled Dressing Room with Fortuny Style! 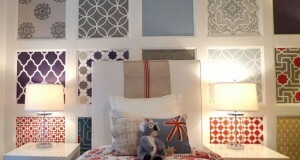 Bee-utiful Stenciled Bedroom Accent Wall with the French Bee Trellis! Très Bon Stencil Style for a Guest Bedroom Headboard! Comments Off on Très Bon Stencil Style for a Guest Bedroom Headboard!